If you are interested in collecting silver or gold then you need to understand the fundamental differences between collecting numismatic coins and bullion coins. First of all – lets look at the definition of both Bullion Coins and Numismatic Coins. According to Wikipedia – A bullion coin is a coin struck from precious metal and kept as a store of value or as an investment. Most bullion coins are or have been a legal tender in their country of origin. Bullion coins are generally available in both silver and gold. Bullion coins are available in different weights, for example, 1oz, 5oz. The value of bullion coins is typically close to the real time value (known as spot price) of the precious metal itself on the commodities exchange. Bullion coins tend to be one of the most popular ways of collecting silver or gold as an “investment” because they are small, tangible and represent an easy way of collecting. The collection of bullion coins in either silver or gold can be viewed as an investment as the true value of a bullion coin is directly related to the spot price of that particular precious metal. Spot prices vary daily. According to Wikipedia – Numismatic coins is the study or collection of coins. Numismatic value is often referred to as “collector value” and this is determined by 2 main factors – coin rarity and coin grade (also referred to as quality/condition). Numismatic coins are “Mint State” which in terms of their condition means that they have not been in circulation and are therefore uncirculated. Mint state coins (know as MS for short) are graded on a scale of 1-70 (known as the Sheldon Coin Grading Scale). Grade MS1 is at the bottom end of the scale and grade MS70 is at the top end of the scale and represents coins at the highest possible grade that are perfect, flawless and museum quality. This scale is used in the numismatic assessment of a coins quality. 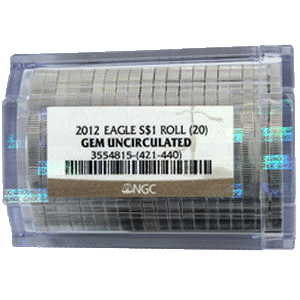 All major coin grading companies use it – be main two being NGC and PCGS. In the collectible numismatic coins market, a coins condition or numerical grade (from MS1-MS70) is massively important. As a general rule – the higher the grade/quality the rarer and more valuable the coin. We see this in almost any collectible market. A low grade diamond for example will always be worth much less than a perfectly flawless diamond. For example, a 2013 American Silver Eagle coin contains one ounce of silver, but on the collector market as a numismatic coin it is valued at around $100 in perfect MS70 condition. That figure is not based on the silver bullion value – but due to the fact that only a small amount of coins have ever been certified and graded as MS70. The coin’s value is therefore based on its grade (i.e. quality/condition) and rarity, NOT its silver content. What Makes Numismatic Coins So Special? Silver numismatic coins are government certified mint state graded assets for the collectors market. Watch the short video below to discover what true wealth you would be sitting on if you had purchased and collected just 1 MS70 Silver Eagle Coin per month from 1986 to 2012. If you would like to learn more general background information about the importance of silver and gold, then we would strongly recommend this book to you by leading expert Michael Maloney called ‘Guide To Investing In Gold And Silver.’ You can buy it directly from Amazon below. In summary – there are essentially 2 different markets for the coin collector to consider. There is the investor market (bullion coins) and there is the collectible market (numismatic coins). The value of a silver bullion coin is based entirely on its actual precious metal content. The coins grade or condition is irrelevant – it is simply an “investment” in the price of silver by weight. 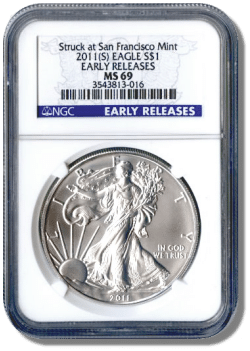 On the other hand, in the case of the Silver Eagle bullion coins, “collectors” look for certified coins in higher grades. These numismatic coins are no longer “investor” coins but become “collector” coins instead. The rarity and grade/quality of a coin can make the difference between it being worth a few dollars for its actual bullion value compared to the same coin in perfect MS70 condition that could be worth many thousands of dollars. I do hope that you have enjoyed reading this post on the topic of Numismatic Coins Versus Bullion Coins. We would love to hear your views on this topic, so please like, comment and share on Facebook. Now that we have explained the differences between numismatic coins and bullion coins, we hope that if you are looking to collect and create real wealth in your life and an extra income, that you would consider joining our leadership team here at ISN Coins – and discover why we only buy our coins directly from ISN. Click Below to take the Silver Giveaway FREE Tour and you be entered into our monthly draw to win a FREE Ms69 American Silver Eagle Numismatic Coin. You will be sent a FREE Solid Silver Rhino bar just for taking the tour! Excellent and concise information, Tristan. Converting a proportion of their paper money into ‘real’ money (silver and gold bullion) plus collectable coins (increasing value over core value) – should be an absolute must for people looking to the future.